“The Good Man” gives us the first glimpse of the hordes of dead that we’ve come to expect from the original series, The Walking Dead. In order to rescue family members, Daniel (Rubén Blades) allows hundreds of soldiers and medical workers to be killed by the infected or left-behind in the chaos. Just as Daniel’s story shows the fluidity of the roles of victim, perpetrator, protector, and enforcer, his narrative is paralleled through the portrayal of the military. The military has been vilified to some degree, but not to the extent where we believe they all deserve to die. In “Not Fade Away,” the National Guard separated the sick from their families, but with our knowledge of what’s to come, the intent seems far from nefarious. In the last episode, “Cobalt,” Daniel discovered that the military had a plan to evacuate and “humanely terminate” the civilians left behind. This places the leadership squarely in the villain camp, though we had yet to see the regular soldiers carry out this plan. In this episode we see soldiers become aggressive with Chris (Lorenzo James Henrie) and Alicia (Alycia Debnam-Carey). Corporal Adams is the only soldier we see portrayed as kind, until he becomes a victim of Daniel. In response to his own treatment, he too becomes an aggressor when he shoots Ofelia (Mercedes Mason). Unleashing the infected on the base may end up saving the civilians in the short run, but will eventually leave them to the same fate as the soldiers. But it never was Daniel’s intention to save anyone except his wife, and maybe Nick. The investment we have in this cobbled-together family helps us to continue to be sympathetic to their plight despite the bloodshed that occurred for them to be together. Perhaps all that urban living is good preparation, but in some ways they seem to have adapted much faster to the hard realities of this world than Rick Grimes ever did. After finding out that the military is evacuating and there are plans to terminate the civilians, it becomes clear that East LA is not as safe as anyone thought. 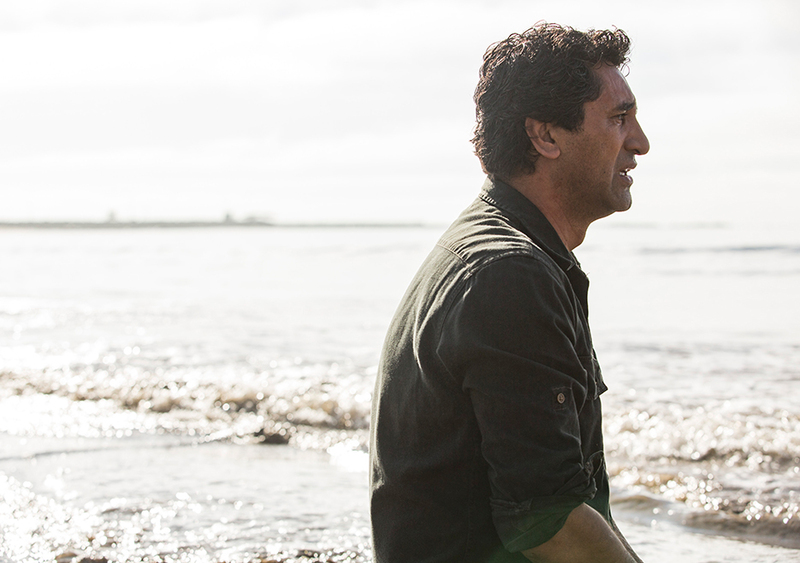 Travis (Cliff Curtis) and Madison (Kim Dickens) tell Alicia and Chris to get ready to leave. They’re going to get Nick (Frank Dillane) and Liza (Elizabeth Rodriguez) and go with their original plan to drive east. Madison and Travis go next door to check in with Daniel, who believes the captive soldier, Corporal Adams (Shawn Hatosy), has given them all he can, implying it’s time to kill him. Travis insists they still need him and they should bring him. As they leave, Madison tells him the soldier can ride in the truck. When Travis asks her if she’s ashamed, she responds, “If Chris was in danger, you’d do anything you could to protect him, wouldn’t you?” Right now, Madison’s worldview is more aligned with Daniel’s than with Travis’s. Driving out of their neighborhood, Madison sees her unsuspecting neighbors sitting at their tables. Are these neighbors doomed to be targeted by the military the next morning? At the hospital compound, Dr. Exner (Sandrine Holt) announces they’re evacuating to Edwards Air Force Base. Liza asks about Chris. Dr. Exner tells her she’ll follow up, but Liza should figure out whom she really counts as family. Liza is willing to settle for Chris and Travis coming with them. It seems quite inconsistent that they would spend so much energy taking care of the sick, and even consider evacuating them, when there is a plan in place by the military to kill healthy civilians. Perhaps the military and the medical personnel aren’t on the same page. Daniel Salazar (Ruben Blades) unleashes the dead. Photo by Justina Mintz/AMC. Daniel arrives at the military compound and walks through the gate. One of the soldiers tells him he’s entering a restricted area, warning him he could be shot if he doesn’t stop. Daniel tells the soldier, “You should save your ammunition,” and a herd of walkers, freed from the arena, enters the gate behind him. Talk about creating a distraction. They meet in a nearby parking garage. Daniel sees that Travis has let the soldier go and is angry. Madison and Travis agree it was the right thing to do, and Daniel responds, “You’ll see where doing the right thing gets you.” His own warning will come back to haunt Daniel. They leave Chris and Alicia at the car to wait, telling them to drive to the campground on their own if they aren’t back in 30 minutes or if anything goes wrong. Inside the compound, Victor Strand (Colman Domingo) tells Nick not to draw unnecessary attention to them. From their fenced area, they can hear gunfire and signs of unfolding chaos outside the compound. Nick reminds Strand of his worth when he shows him the key Strand thought was in his pocket. They escape their cell, leaving the other prisoners trapped in their pens. Strand tells Nick there’s no added value in helping the others. In the parking garage, Alicia and Chris argue. When Chris says he doesn’t want anyone to die, Alicia tells him he sounds like his dad. Alicia tells Chris that not everyone can be saved. They hear a noise and hide in the car. It turns out it’s soldiers looking for transportation. The soldiers want to take their SUV, even though they just broke the window. They begin harassing Alicia, and when Chris tries to protect her they knock him out. The worst aspects of humanity are already coming out. Liza is outside, along with the soldiers and nurses trying to evacuate, She watches the melee of the dead attacking. The dead eventually knock down the fence around the compound, and Liza runs back inside. 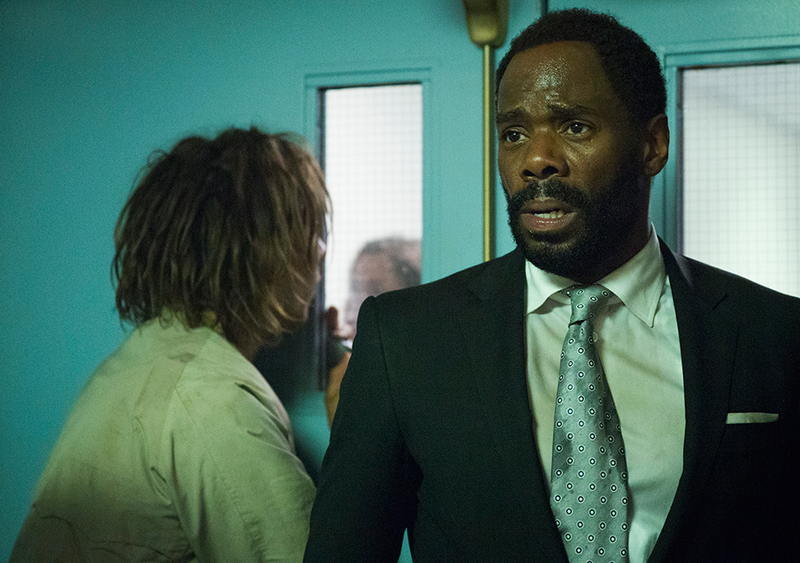 Nick Clark (Frank Dillane) and Strand (Colman Domingo) trapped, as the infected approach. Photo by Justina Mintz/AMC. Strand and Nick walk through the compound, avoiding soldiers. They make their way into a wing where they find one of the infected chewing on a soldier. When Nick warns him to stay back, Strand responds, “It’s all right. They’re slow.” The soldier turns out to be Melvin, whom Strand had traded with to keep Nick safe. Strand takes his cufflinks and Melvin’s gun. When Melvin asks Strand to kill him, he responds, “You’re well on your way,” and leaves him as more infected come into the room. Nick Clark (Frank Dillane) tells his mother, Madison Clark (Kim Dickens), to leave him. Photo by Justina Mintz/AMC. They run back up the corridor, but it has locked behind them. As Strand fires at the approaching dead, Nick sees his mother, Travis, Daniel, and Ofelia coming towards them, on the other side of the locked door. Travis and Madison try to break open the door, but they are unable to, and the infected are approaching. Nick tells his mom to just go. But his moment of redemption is interrupted when Liza arrives with her keycard, opening the door just in time. Nick introduces Strand to his mother as the man who saved his life. 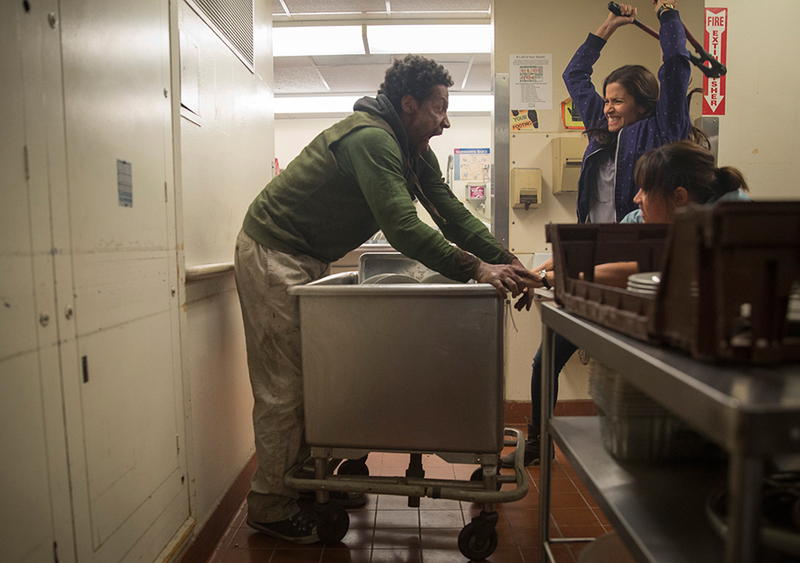 Ofelia Salazar (Mercedes Mason) and Liza Ortiz (Elizabeth Rodriguez) fight the infected. Photo by Justina Mintz/AMC. The group makes it to the cafeteria, but are attacked by the infected. Madison has found a hammer again, which could become her weapon of choice. Despite this being the first physical altercation most of them have had with the dead, they are able to fight them off. As they continue on their way, Daniel asks Liza about Griselda. She tells the Salazars that the infection took her and that Griselda is dead. Ofelia wants to go and see her, but Liza tells her there’s nothing left to see. The ashes of the infected dead. Photo by Justina Mintz/AMC. They enter the infirmary and find Dr. Exner still tending to the sick. Madison scoops up a bunch of meds for their trip, and they ask how to get out of the compound. Liza tries to convince her to come with them, but Dr. Exner tells her there’s nowhere to go. As they leave, Dr. Exner continues to sit with the patients. As the group continues through the hospital, Strand asks what their plan is and Madison says they’re going east. He suggests they go west, where he has a house on the water. Strand has prepared and has supplies at his house. 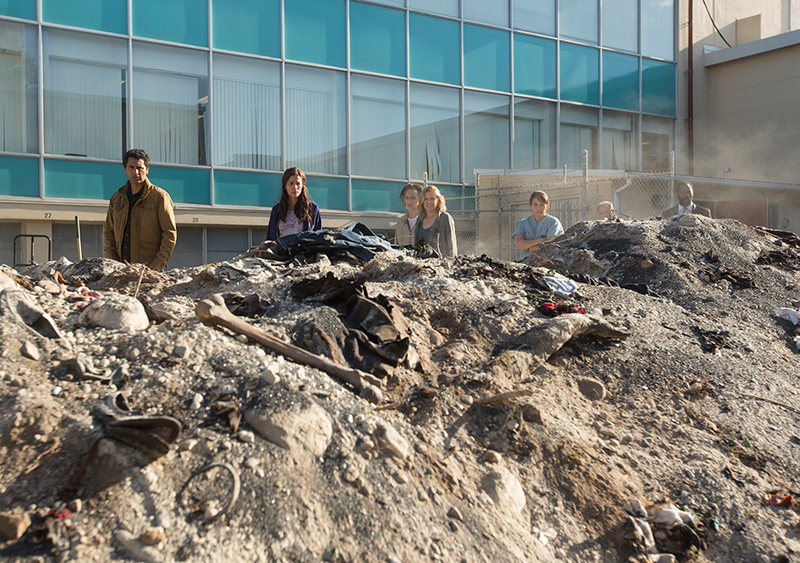 As they walk out to the roof, they see piles of ashes from the burned corpses. Ofelia begins to cry, mourning her mother. 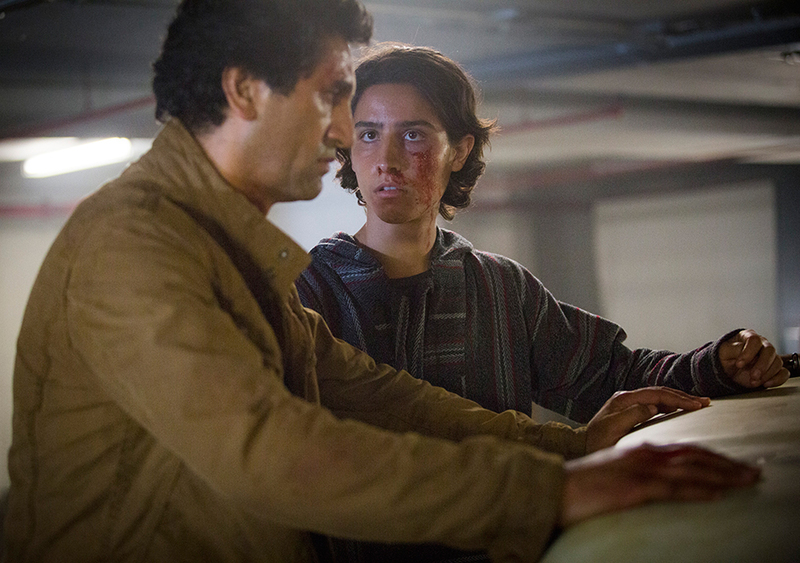 Travis Manawa (Cliff Curtis) and Christopher Manawa (Lorenzo James Henrie) reunite. Photo by Justina Mintz/AMC. They reunite with Chris and Alicia in the garage. Their reunion is cut short when Corporal Adams appears with a gun aimed at Daniel, his torturer. Rather than targeting Daniel, he shoots Ofelia, hitting her in the arm. Travis tackles the soldier and beats the tar out of him, until Madison finally stops him. Travis has finally reached his breaking point. As they drive down the freeway, an aerial shot of LA shows fires all over the abandoned city. When Strand tells Madison not to risk taking the freeway, she asks him if he wants to go back. He responds, “You’re funny. We’re gonna get along just fine, Nick’s mom.” He tells her to follow the river down to the sea. They follow the concrete aqueduct that is the LA River down to the ocean, coming full circle from the pilot. They arrive at Strand’s luxury ocean home. Everyone seems vaguely stunned. It’s hard to tell if it’s because of what they just survived or because they are so amazed at his house. Probably the survival thing. 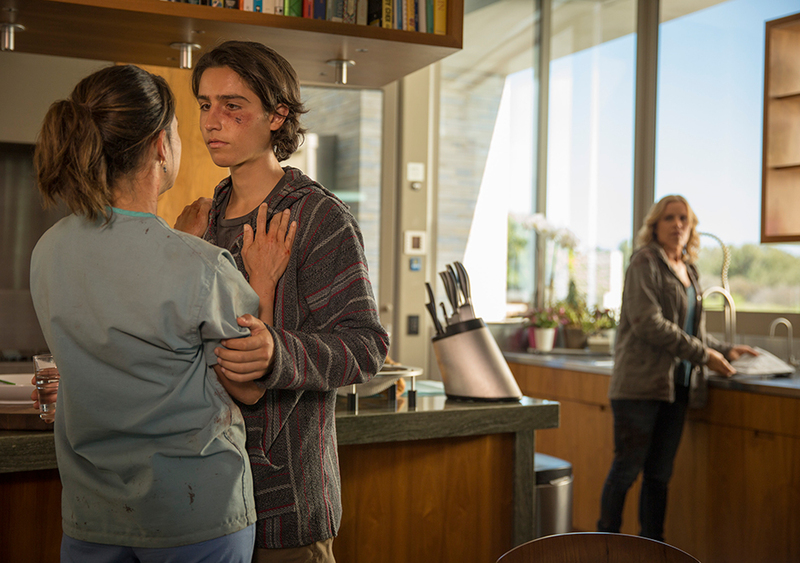 Liza Ortiz (Elizabeth Rodriguez) hugs her son, Christopher Manawa (Lorenzo James Henrie) as Madison Clark (Kim Dickens) watches. Photo by Justina Mintz/AMC. Inside the house, Liza gives Chris a hug and tells him she loves him. When Liza walks towards the ocean, Madison follows her. It’s as though as a mother, she recognized something in Liza’s face as she hugged her son. As Madison walks across the lawn, Travis sees her and follows. Nick comes upon Strand packing. Nick doesn’t understand why Strand brought them there if they aren’t staying. Christopher Manawa (Lorenzo James Henrie) and Alicia Clark (Alycia Debnam-Carey) hear gunshots. Photo by Justina Mintz/AMC. Liza makes Travis promise to protect Chris and he takes the gun from Madison. Both Liza and Travis show a lot of strength in this moment. Chris and Alicia hear the gunshot from the house. Chris cries over his mother’s body, while Travis flees to the water to mourn over the loss of Liza and the man he once was. It’s not clear why they couldn’t wait a couple days so Liza could spend more time with Chris. Perhaps Liza isn’t sure how long the infection takes to kill someone, or she’s worried she will infect someone before she dies. It could be that she only has the courage to go through with it now, after having just witnessed the devastating nature of the infection and its aftermath. “A Good Man” refers to Travis and his attempts to do what’s right in this complicated new world. Though Daniel calls him weak, it takes a lot of strength to try to be a good man. This is the same moral quandary we see throughout The Walking Dead series. As society collapses, there are no rules or laws to govern people’s actions, only their own inner moral compasses and the norms they construct within their own small groups. Though we lose Liza in “A Good Man,” we are left with hope for this group’s survival as Fear the Walking Dead proceeds into the next season.